Do you have forested property that you feel is at risk for wildfire? Has your forested property burned in a wildfire? Do you have any other resource concerns on your forested property? If so, the Resource Conservation District of Greater San Diego County (RCDGSDC) may be able to assist you. 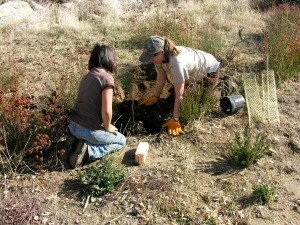 The RCDGSDC is offering Conservation Planning to landowners in our operating area. This is a free service designed to help property owners minimize resource concerns on their property. Through this program, RCDGSDC staff works with each property owner or manager to develop a Conservation Plan unique to that property, which details Best Management Practices (BMPs). These BMPs can then be implemented by the landowner to eliminate or control any problems or issues identified during the planning process. Conservation Planning is a cooperative process that requires input from the landowner to be successful. Throughout this process, staff will assist with setting priorities, complying with government regulations, and completing the BMPs, to keep your property productive and healthy for the long term. If you think a Conservation Plan could help you, please contact us at (619) 562-0096.